Interested in new multiplayer maps for Halo: Reach created by Bungie? A first-person shooter can't go very long without releasing a downloadable expansion pack anymore, and Halo, one of the franchises that started the trend, sure isn't going to be any different when it comes to Halo: Reach. Microsoft has recently announced the details on Halo: Reach's first DLC pack, developed by Bungie, which is set to launch next month. 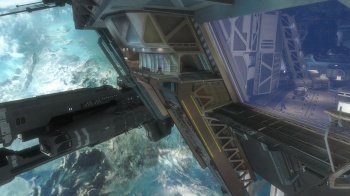 Halo: Reach's Noble Map Pack will include three new maps called Tempest, Anchor 9, and Breakpoint. Tempest takes place on-planet near a shoreline and two symmetrical, abandoned bases. It supports 8-16 players in multiple modes, and adds to Reach's Forge palette so players can create new map variants. Anchor 9 has players leaving the safety of terra firma to duke it out in an orbital dockyard used to rearm and refuel UNSC vessels. Up to 8 combatants will be fighting both within the safety of its artificial gravitational field, and on the ledges outside. Breakpoint brings players planetside again to a set of modular archaeological labs trying to remain in operation despite the large-scale Covenant threat. It's said that the secret work being done at Breakpoint is crucial to the survival of humanity, not that the 8-16 players engaging in modes like Invasion and Big Team Battle will care a whole lot about that. The Noble Map Pack includes new achievements that will allow Gamerscores to be increased by up to 250 points, and is coming on November 30 for 800 Microsoft Points. Don't expect this to be the end, as Microsoft is likely holding more Halo: Reach maps in its sleeve for December or early 2011 if my crystal ball is correct.